Pam: CHIBI BUMBLEBEE SAILOR for the win!!! It’s a petite Progear that is small enough that the pen gets posted by screwing on the end of the pen. 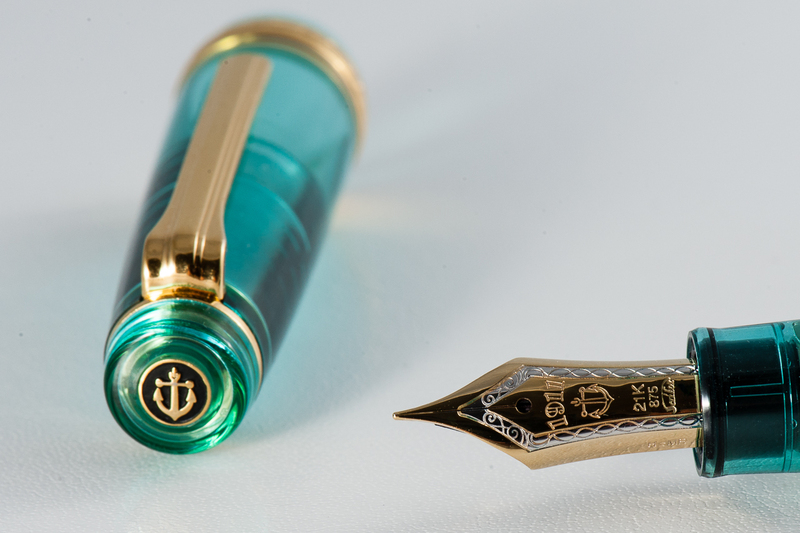 Sailor pocket pen are three words that send my heart swooning; great things come in small packages. Unfortunately, these are not being made anymore. They are available on the secondary market. 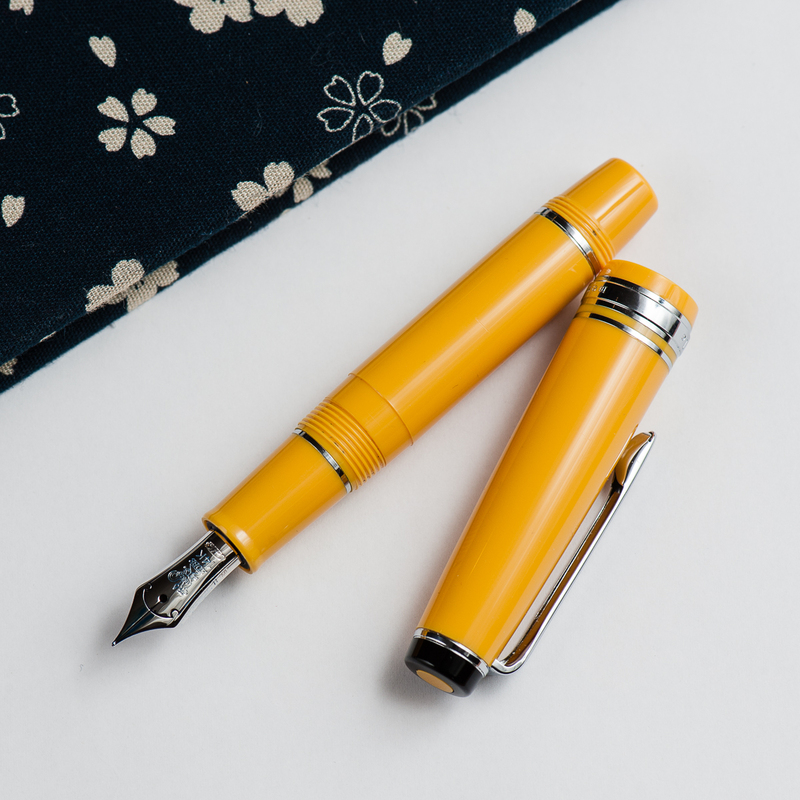 Franz: The Sailor Pro Gear Mini is so tiny and charming especially in this yellow finish! Pam calls it bumblebee and I can see that too but in my mind, I refer to it as a banana pen. I don’t know… it’s just something about that black cap finial that makes me think of one of my favorite fruits. 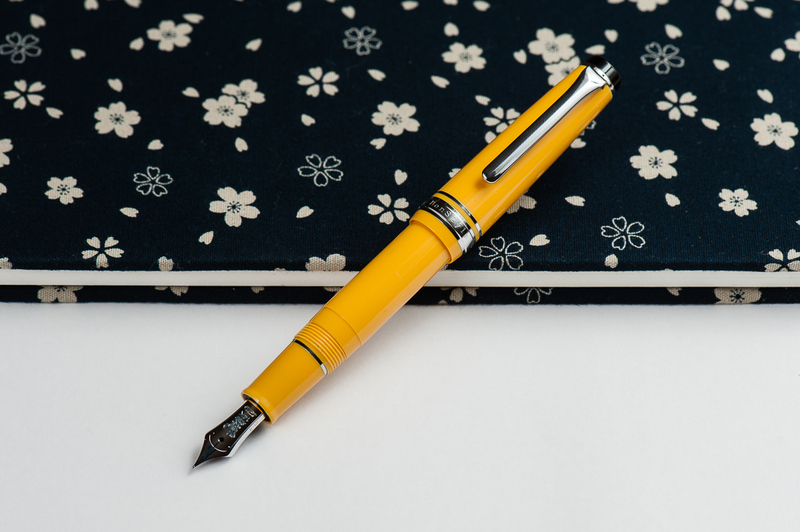 Katherine: It’s the the same Sailor MF 14k as a Pro Gear Slim (it’s really just a Pro Gear Slim with a shorter barrel, after all) — and unsurprisingly, I really enjoyed it. It’s broad enough that I can see the color of the ink, but fine enough that I can stick to my usual tiny hand writing. Pam: It’s a Sailor MF (medium-fine) nib. It’s in the great sweet spot of a slightly wetter/broader line that isn’t too wet. I would recommend putting in an ink that you want to show off. Perhaps an ink with some sheen. I don’t find as much feedback with this Sailor nib, which makes sense given that the MF nib is a bit broader. Franz: The Mini’s medium-fine nib is very nice to write with. Just like most Sailor nibs I’ve tried, it was very smooth. The M-F line width is actually a good one for me as I find Sailor’s fine nibs just “a little” too thin of a line for me. 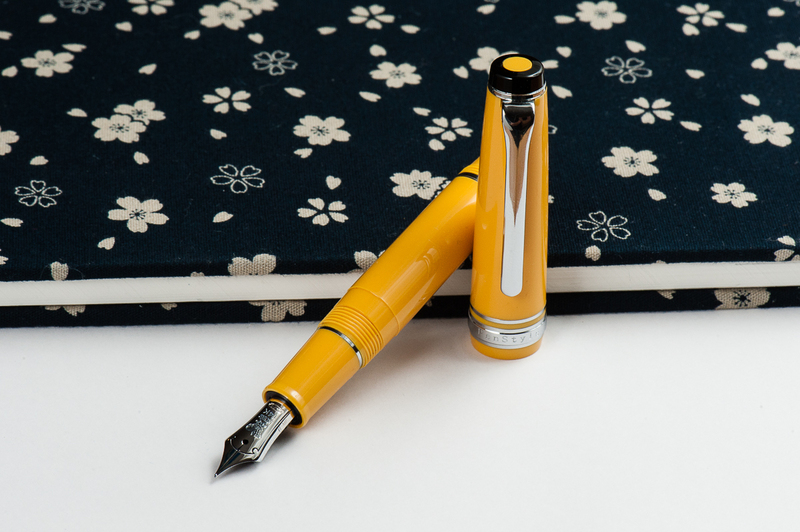 The design on this nib is different from any other Sailor pen because this was a pen commissioned and sold by the Nagasawa Kobe stores in Japan. Katherine: I found this pen usable, but slightly short when unposted. It’s one of the few pens that I prefer posted to unposted. 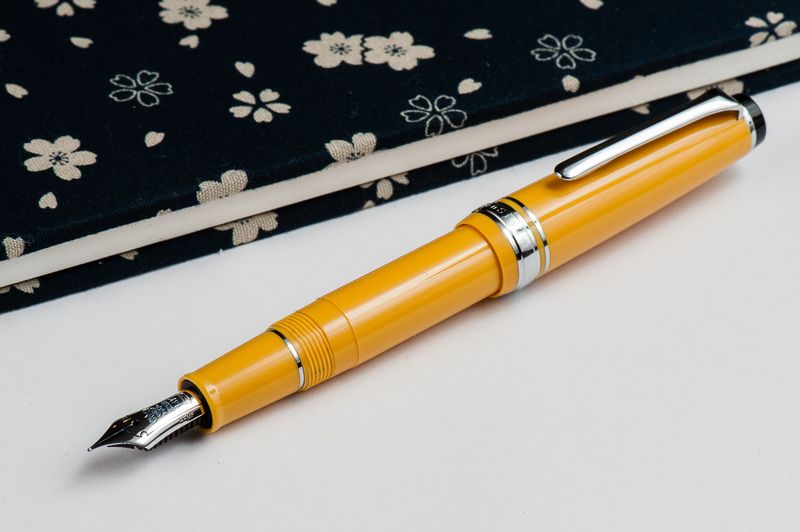 Like the Kaweco Sport, when unposted, this pen makes my hand a bit tired after a while because it’s just barely long enough to fit in my hand and I have to be careful about how I position my hand. Posted though, it’s fantastic — like a slightly longer Pro Gear Slim! Pam: The size of the pen posted is similar to the Sailor Progear Slim. The width of the pen is exactly that of the Sailor Progear Slim actually. 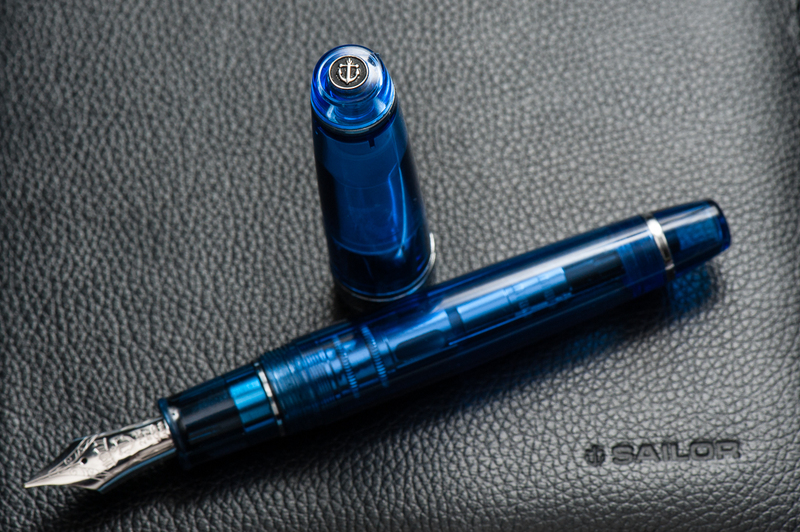 They section and body are swappable amongst the Sailor Progear Slim and Mini. 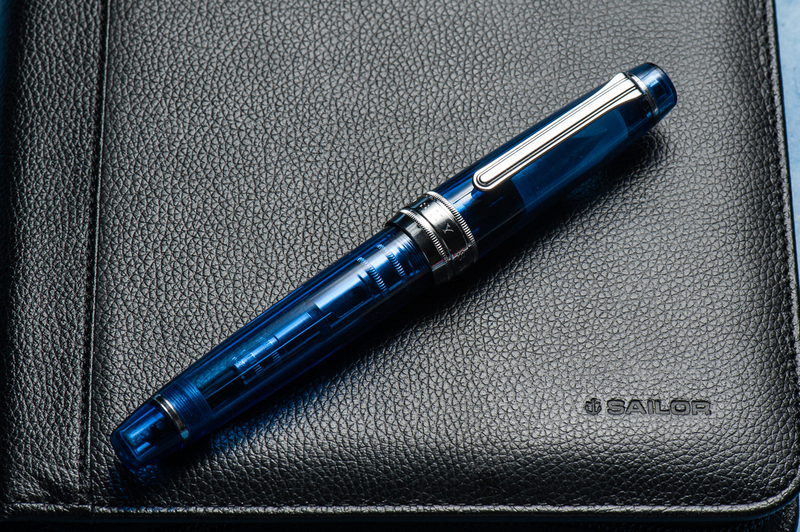 Other than the length, if you find the width of the Sailor Progear Slim comfortable, this pen won’t be a problem for you. Franz: I wrote in my journal with the Mini only in the posted mode because it was quite difficult to write with the cap unposted. I found that the posted length made it a little more comfortable for me. The girth of the section was quite thin for me so I end up gripping the pen on the threads. They weren’t too sharp and I barely noticed them. Katherine: It’s great for quick notes and pocket use. It’s tiny, brightly colored (and hard to lose…) and seems plenty durable, not that I threw it against a wall or anything. Pam: I kept this pen with my Hobonichi A6 notebook cover and it kept up with my adventures in my bag. It’s really portable. 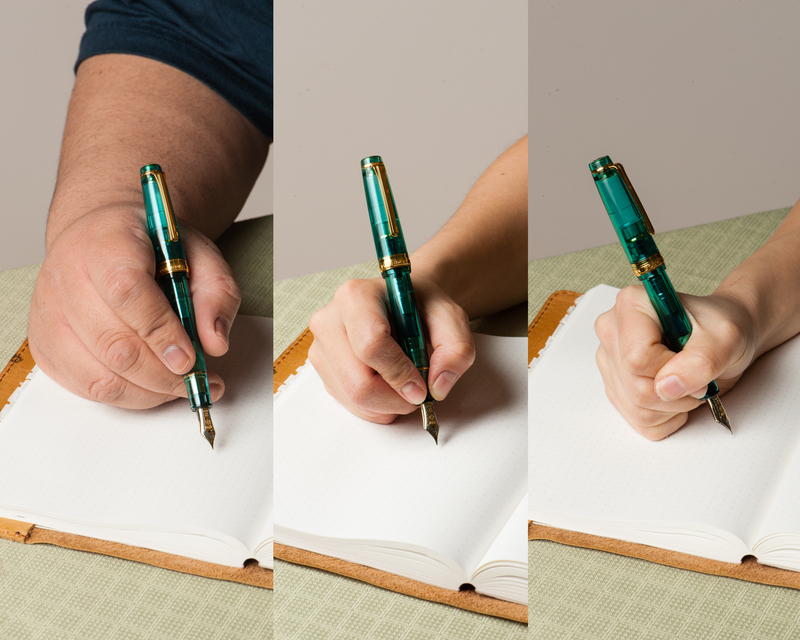 It’s not the best for quick notes given that you have to screw the cap onto the body to post, However, if you have particularly petite hands and don’t need to post it, a which quick twist of 1.5 rotations, will get you writing pretty quick. Franz: Ahh… every day carry. It is definitely a pen that fits in your pockets. The M-F nib is actually very appropriate for use on cheap copier papers as the line is thin and the ink spread is minimal. But I don’t think I can recommend this pen for large handed writers because after 2 or 3 words, it’s hard to write with the pen unposted. This is due to the pen falling into the crook of my hand and is uncomfortable. I’d need to post the cap and screw it onto the barrel which takes quite a bit of time if you are constantly needing to cap and uncap for quick usage. It takes almost 2 turns to uncap the pen and then another turn or two for posting the cap. Small hands? No problem as you can see from the two ladies’ experience. 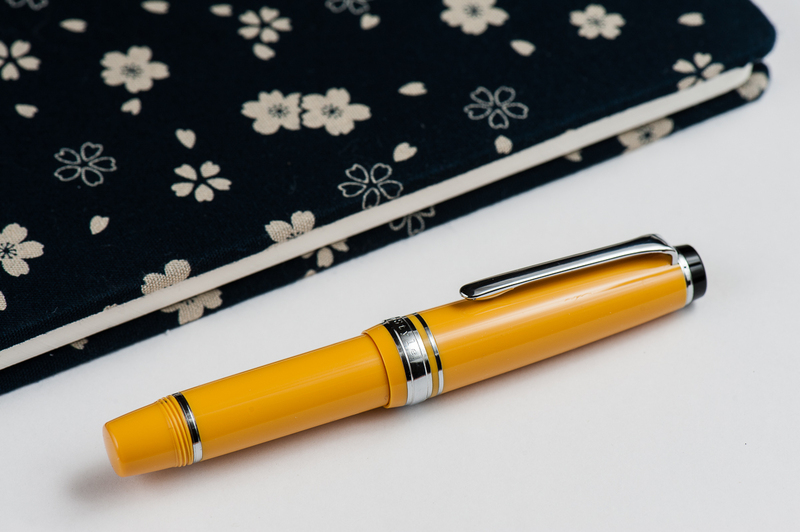 Katherine: This pen is really cute — but between this and the Pro Gear Slim, I’d prefer the latter. It’s just a little more flexible and accommodating for my hand. 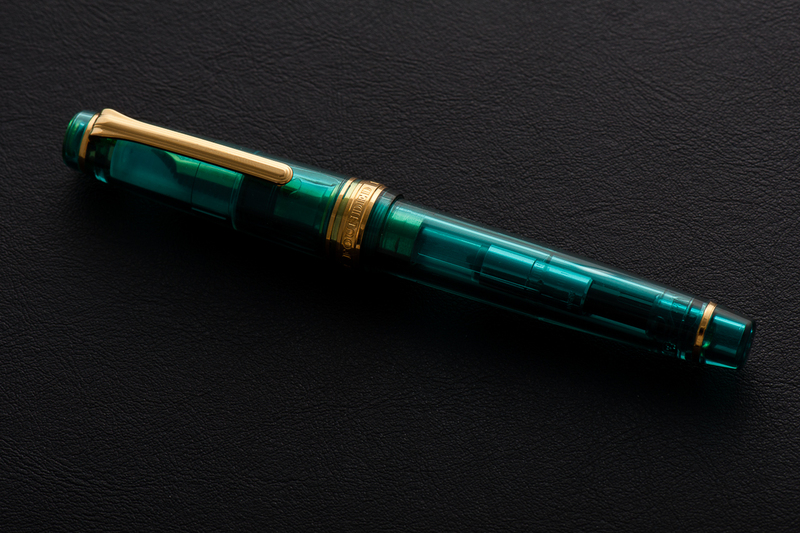 But if short pens are your thing — this is definitely a great fit. Pam: It’s a chibi Sailor for chibi hands. 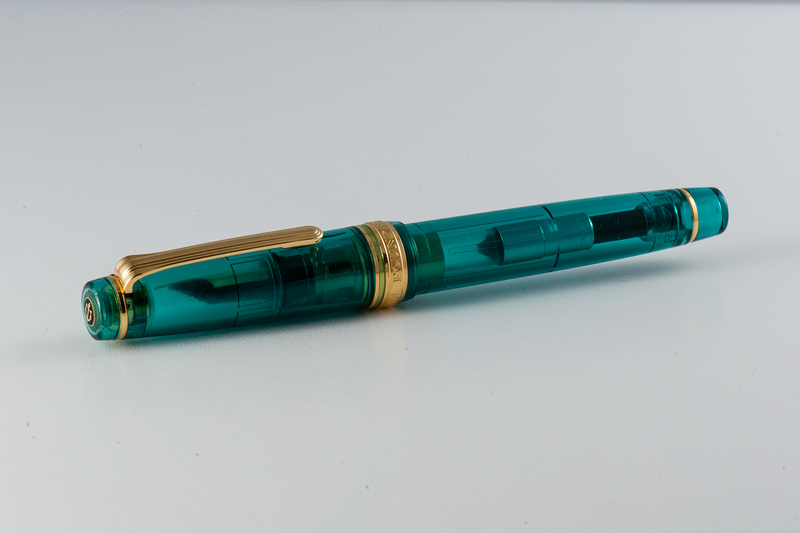 It’s a solid Sailor pen, albeit small. If you are into challenging yourself on how small of a pen you can comfortably write with (like Franz), this is a great pen to borrow from smaller hand friends. 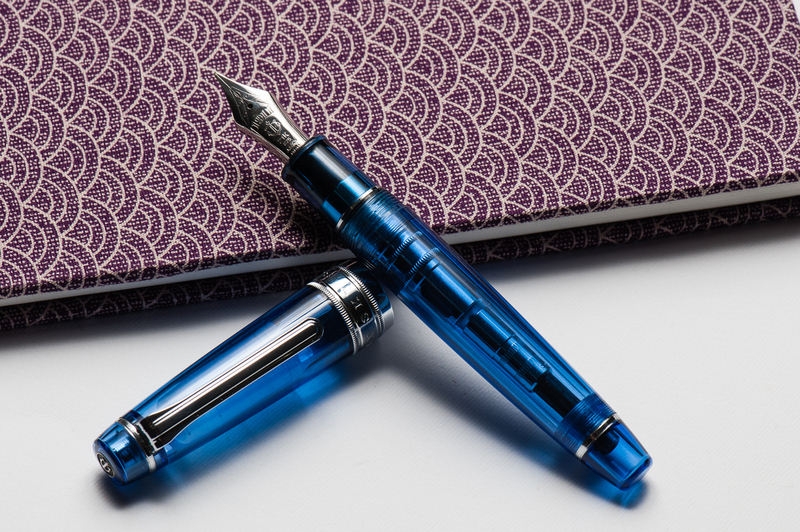 If you are looking for a great pocket pen and don’t mind the extra work posting, you will be rewarded with this Sailor. Franz: I really like the Pro Gear Mini a lot, and want one for myself. 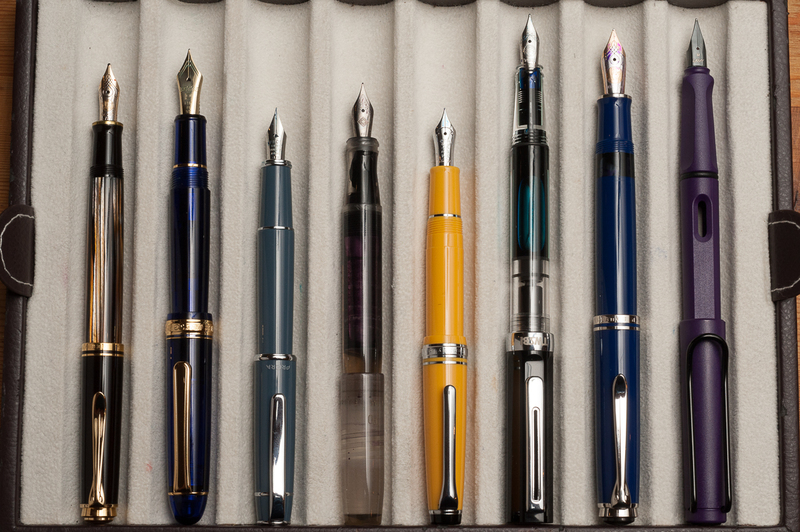 But to be honest, this is more because of me just hoarding wanting the pen in my collection. As a journal, or letter writing pen, I’d use this pen again. 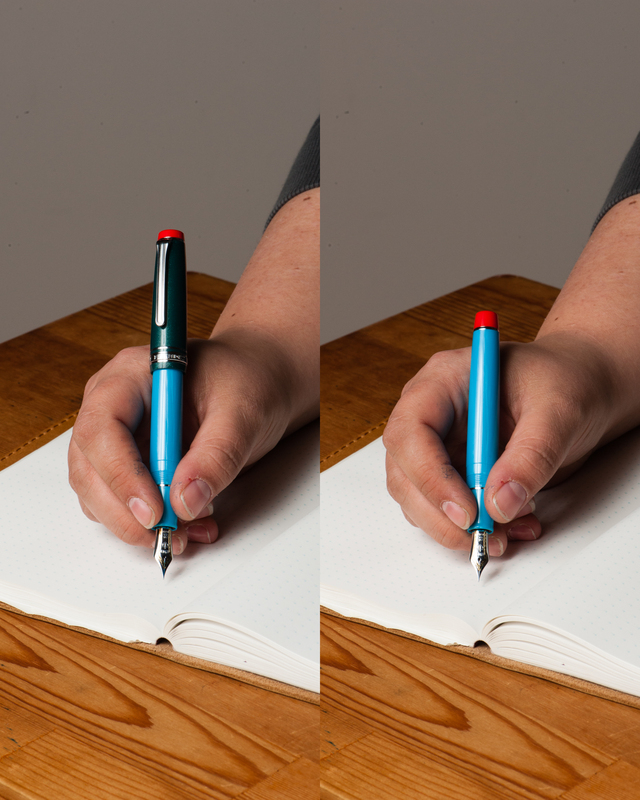 The Mini is a pen more suited for people with a small, or medium hand size. This is coming from a guy who uses his King of Pen Pro Gear a lot in the workplace and for daily use. 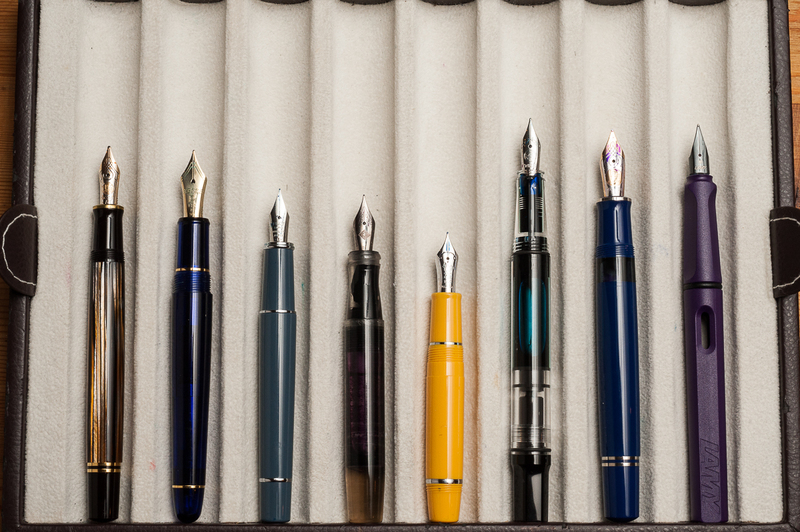 As well as a guy who constantly annoys pen friends by singing, “I like big pens and I cannot lie…!”. Happy 2018 folks! Thank you for your continued readership and we are looking forward to provide you with more reviews, and other interesting content. 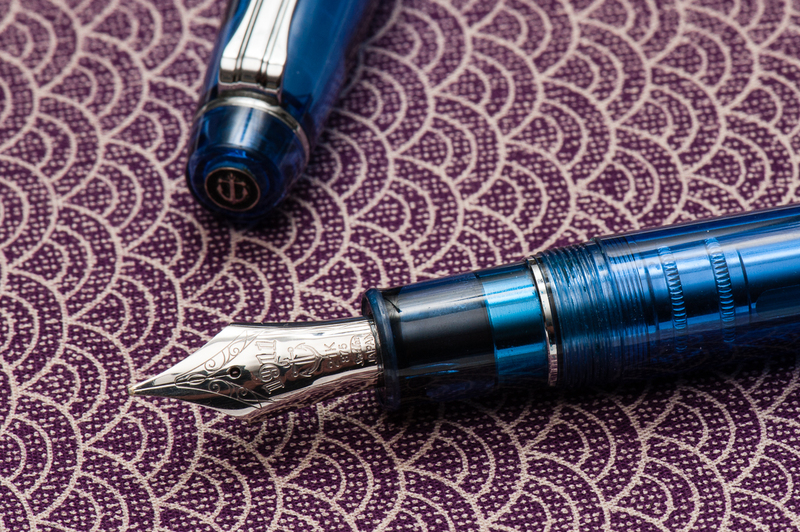 And for our first pen review of the year, here’s a blue pen from Sailor. Also, just in case you’re wondering, the notebook the pen is resting on is a Musubi handmade diary just arrived from Singapore. We may review this notebook after some use. We are not affiliated in any way. 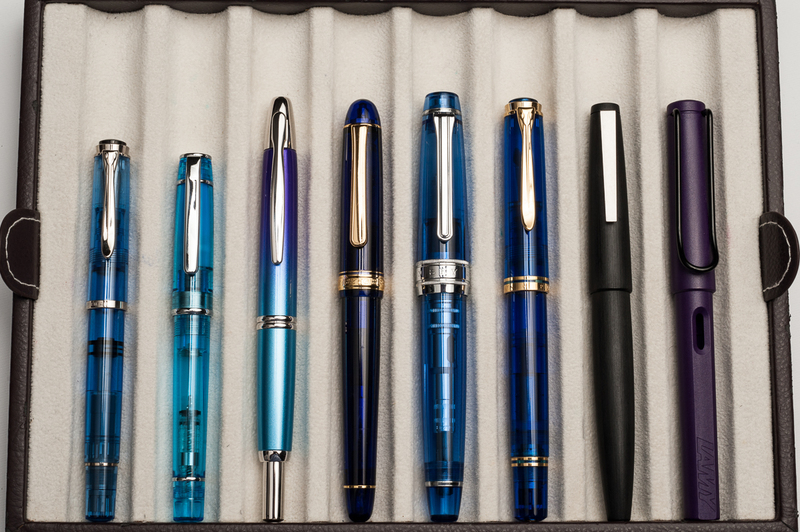 They were quite popular at the San Francisco Pen Show in 2017 and they’re friendly people as well. Katherine: Ahhhhhh. I want a sky. They look so cool. Even the converter showing looks cool! Franz: “Blue Sky smilin’ at me, nothing but blue Sky… do I see…”. Ever had a pen make you just wanna sing? Well, this King of Pen (KoP) Sky did it for me and I got Sinatra’s voice in my head. 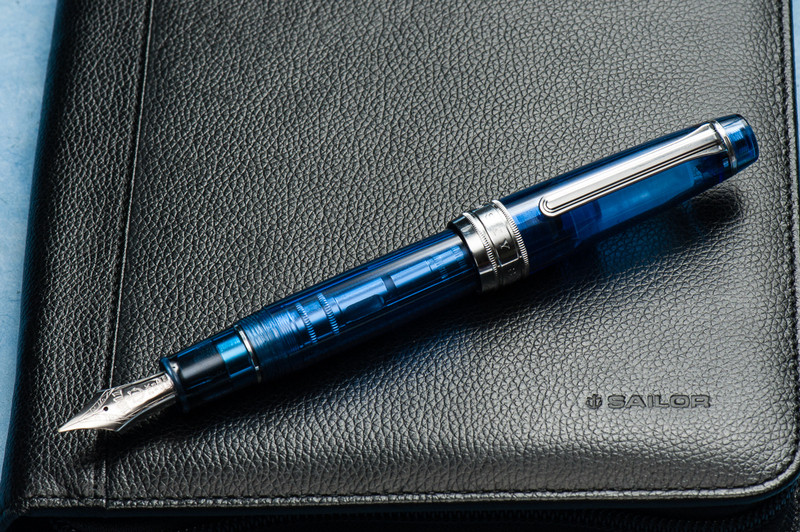 It shouldn’t come as a shock to a lot of people that I just adore the blue finish of the pen and the shape of the Pro Gear is a great aesthetic as well. 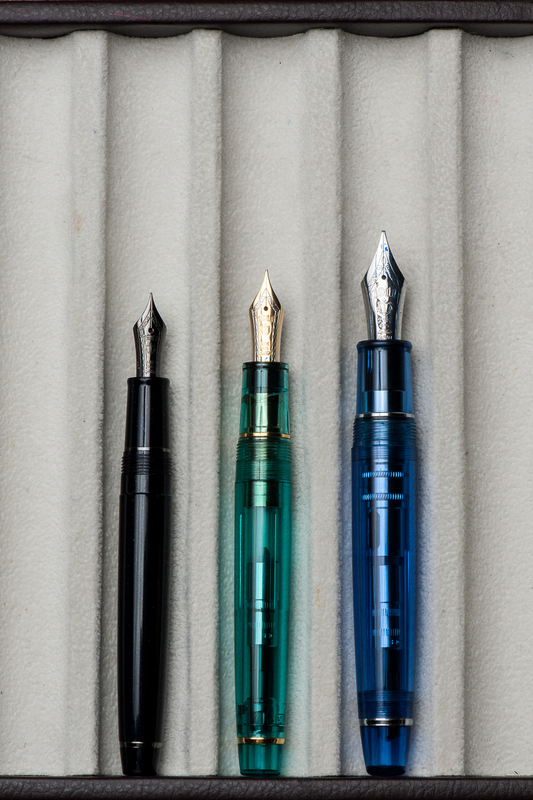 I’d say that in my hand, the Pro Gear KoP size is in between a Pelikan M800 and Pelikan M1000. A pen of substance if you will. Katherine: Being one of Franz’s, this pen sports a wonderful BCI. The nib is quite large, but a joy to write with. Smooth, juicy without being sloppy and capable of crispy line variation. Pam: Sailor has one of the most beautiful and consistent nibs on the market. The KOP nib is no exception. The cursive italic was expertly ground and the slight springiness of the nib allows for a great ink flow. 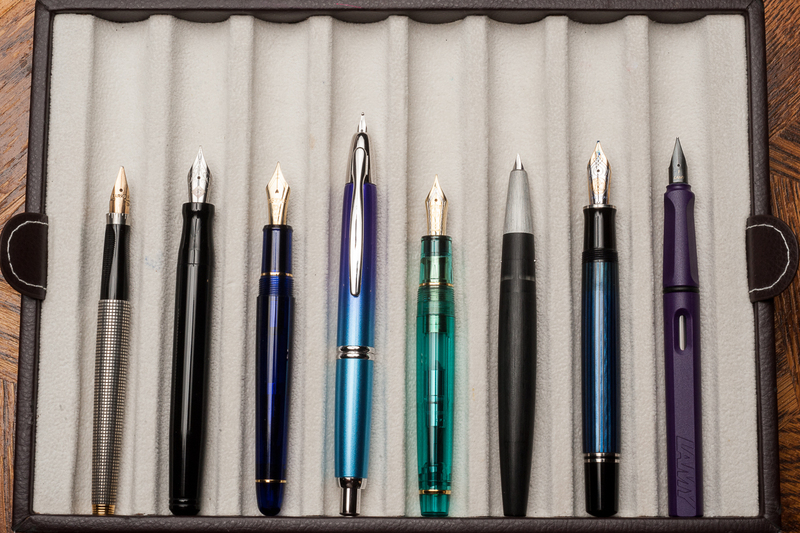 Franz: Mirroring what Pam said, Sailor nibs are well tuned with a hint of feedback out of the box . I’ve purchased a couple Sailor pens in 2017 and it wrote oh so perfectly for me without any adjustment. I got this pen second hand via a well-known auction site for a great price but when I got it, I found that the tines were a bit misaligned and almost too far apart. I inked it up and found that the flow was too much. So what do you do in this situation? 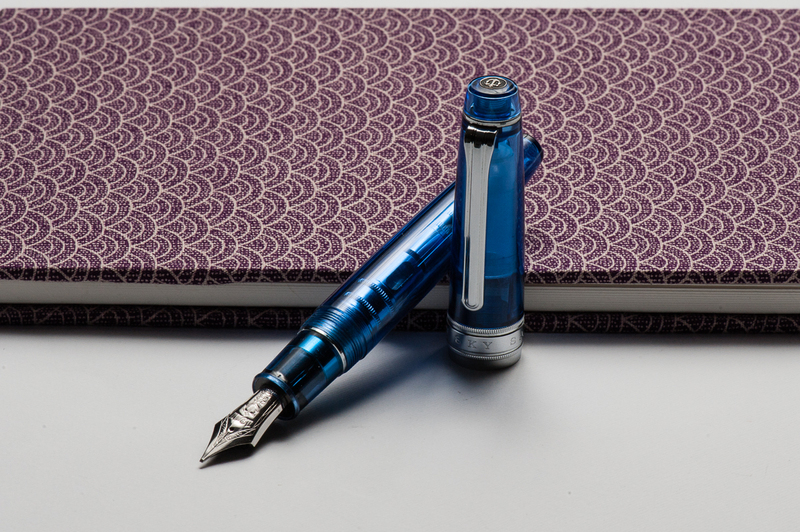 You wait for the next pen show and ask Mr. Mike Masuyama to take care of it! Which is what I did and I also asked Masuyamasan to transform the Broad nib into a crisp cursive italic. Been loving the nib ever since. Katherine: The KOP Pro Gear is a little bigger than I’d prefer, but still very comfortable and usable. I had no fatigue using it for extended periods, but do prefer the standard sized Pro Gear overall (better for my wallet, I suppose). Pam: This size reminds me of the Pelikan M800 where it appears to be intimidating to those with pixie hands but is surprisingly comfortable. 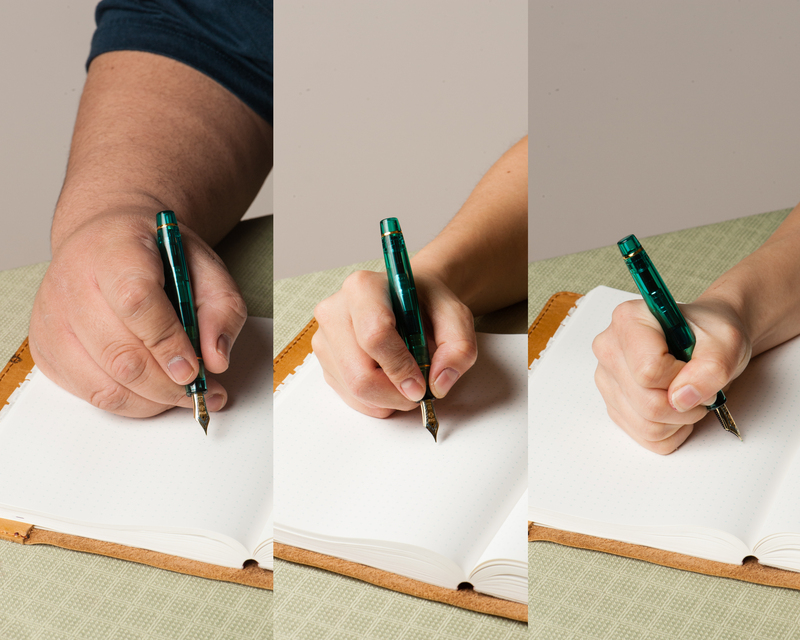 I find that the girth of the pen to be comfortable to hold for long periods of time. The weight of the pen doesn’t seem to bother me at all as it’s a well balanced pen when unposted. It does get long and more unwieldy for me when posted. 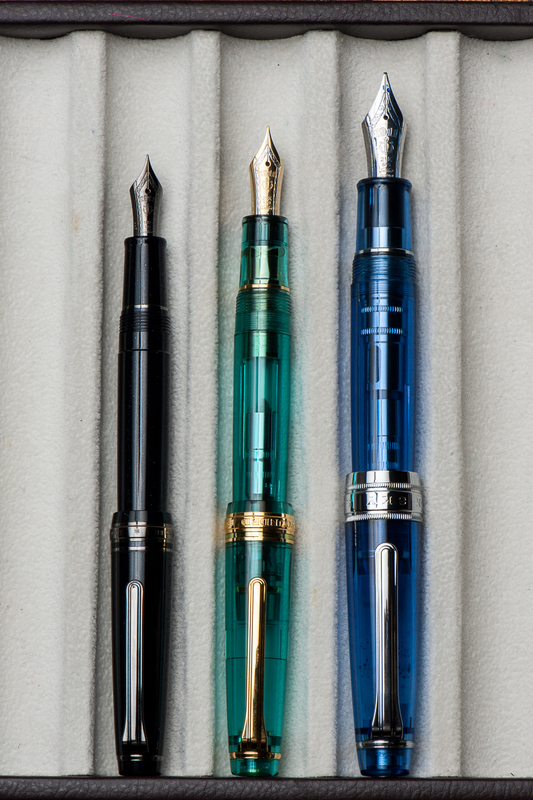 Franz: As I mentioned in the beginning, the Pro Gear KoP’s size is between the Pelikan M800 and M1000. These are two pens that I’m very happy to write with so this pen definitely fills my hand well. I wrote with the Sky in both posted and unposted modes at 10 minutes each and found that I’m comfortable either way. I lean more towards writing with cap unposted because it’s just a little bit more balanced that way. The cap band does place a bit more weight when posted but it wasn’t top heavy at all. Katherine: Works just fine as an EDC. The clip is strong and it takes 2 cap turns to uncap, which isn’t crazy, but feels extra secure. Pam: This would be a pretty good EDC pen. The only down side is that this beauty maybe a bit too eye catching. 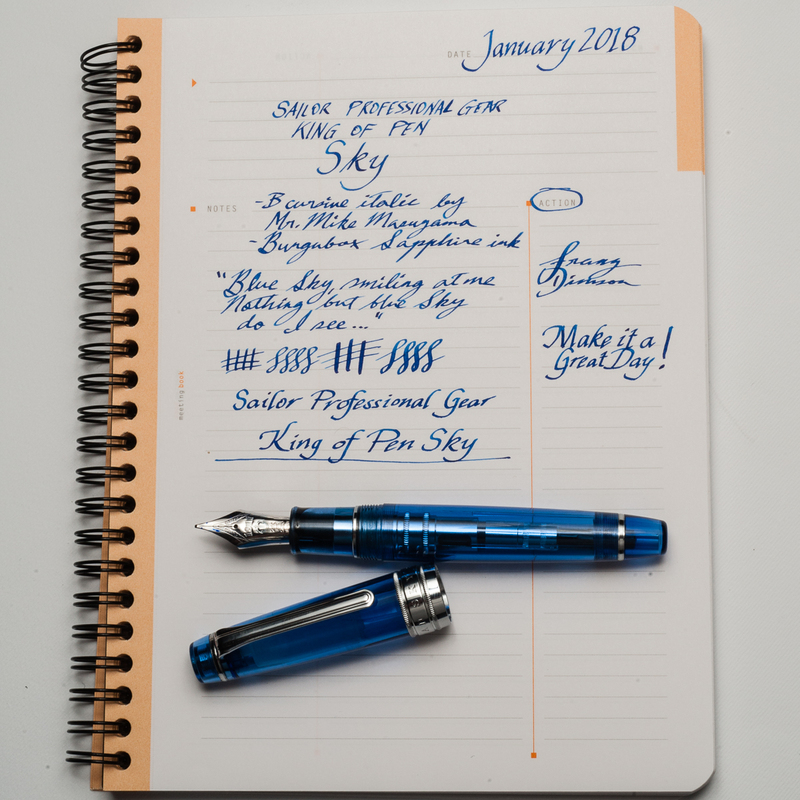 Franz: I use the KoP Sky at my workplace quite regularly and found it very useful as a daily carry pen. The broad cursive italic was just perfect for the copier paper we use as well as on my Rhodia meeting book. The clip like every other Sailor is very secure on my dress shirt pocket and the 2 turns to uncap isn’t too bad at all. It does fill either via cartridge/converter so I found myself refilling the converter after 3-4 days of use. 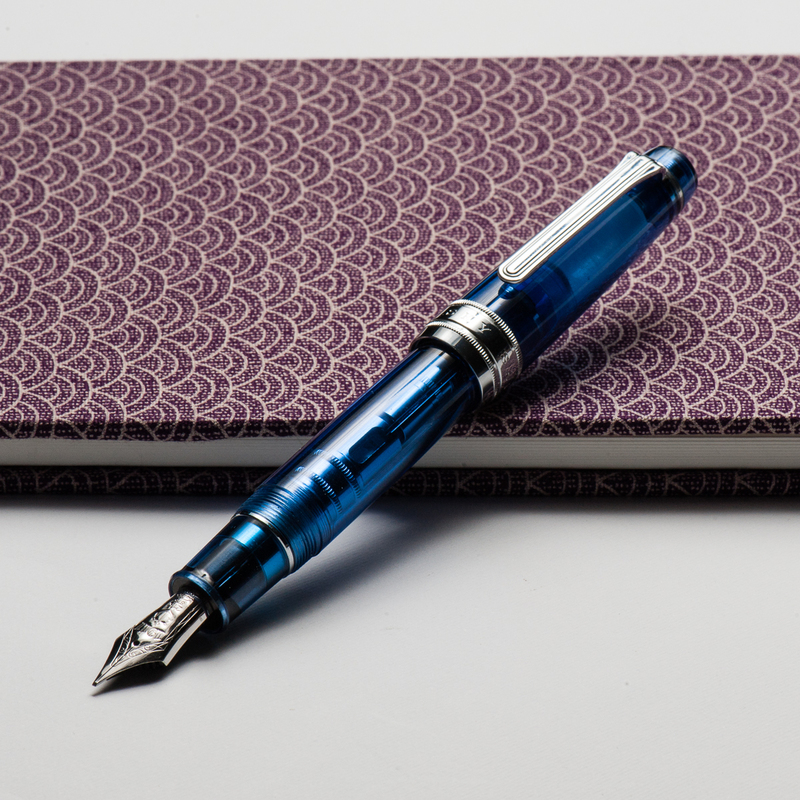 Pam: The Sailor KOP is a fantastic pen for those who enjoy the Sailor Progear but want something with a bit more heft and solid feel in hand. 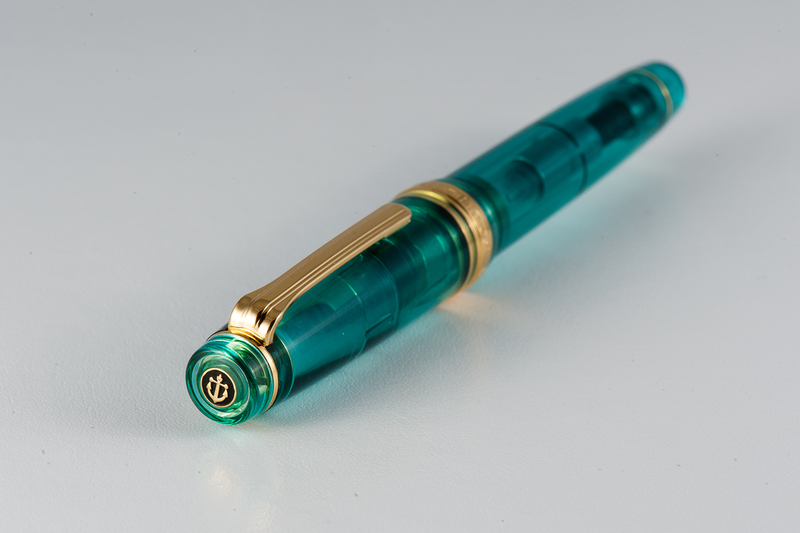 It could easily become a daily carry pen or “the” pen that is constantly inked. 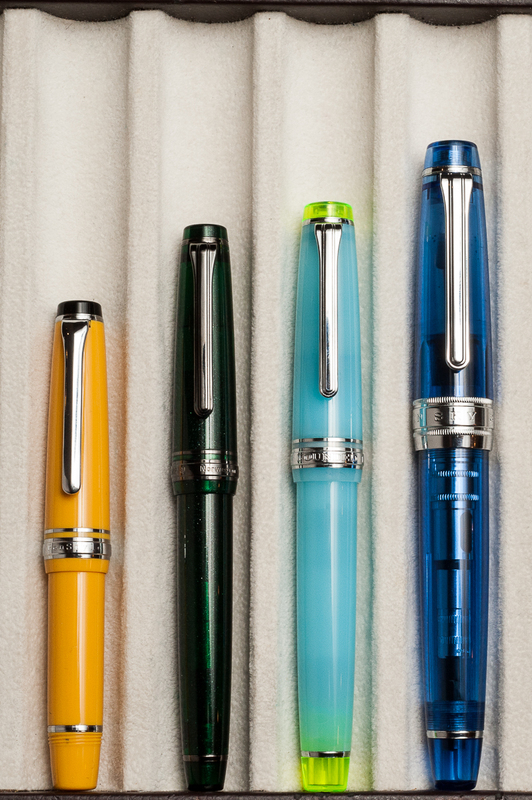 If there was a KOP in the right color (combination), it would easily make it to my grail pen list. 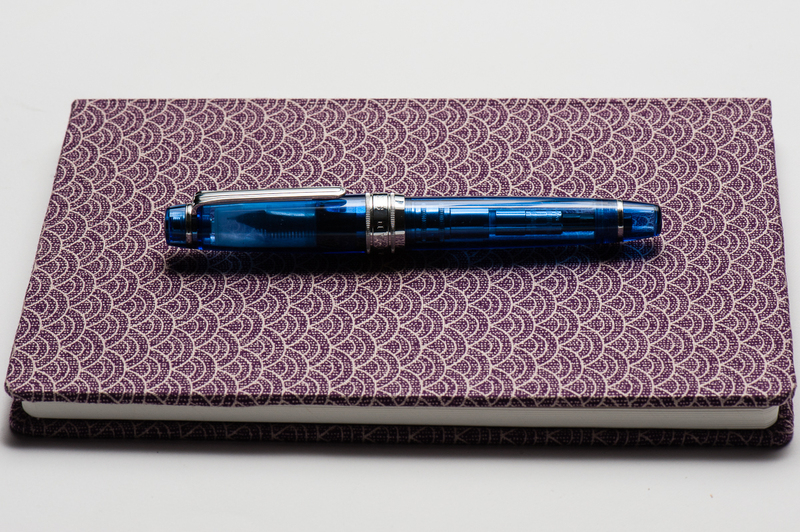 As much as I love the Sailor Progear Slim and Sailor Progear, the KOP is an easy yes for me. Too bad my wallet says no alot more than I do. Franz: Four words. Bear paws are happy! The Pro Gear King of Pen is definitely for medium to large sized hands (but Pam who has the smallest hand among the 3 loves it) and I truly prefer this against the Classic size of the Pro Gear pens. 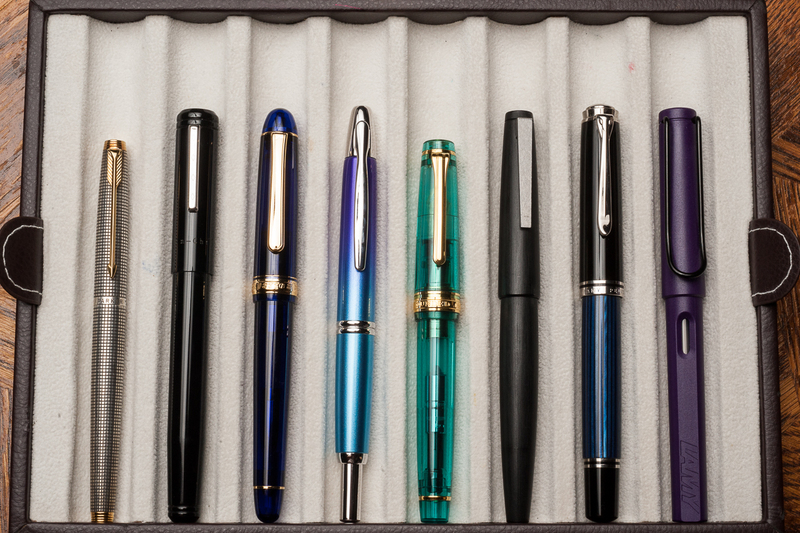 In the photos below, the Pro Gear size comparisons dramatically show the big step up in size between the Classic and the King of Pen. 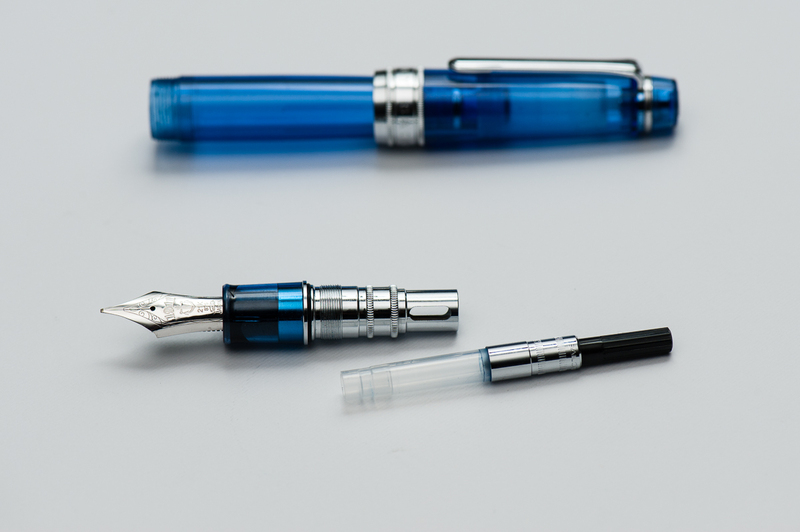 Another key difference of a King of Pen is its nib. 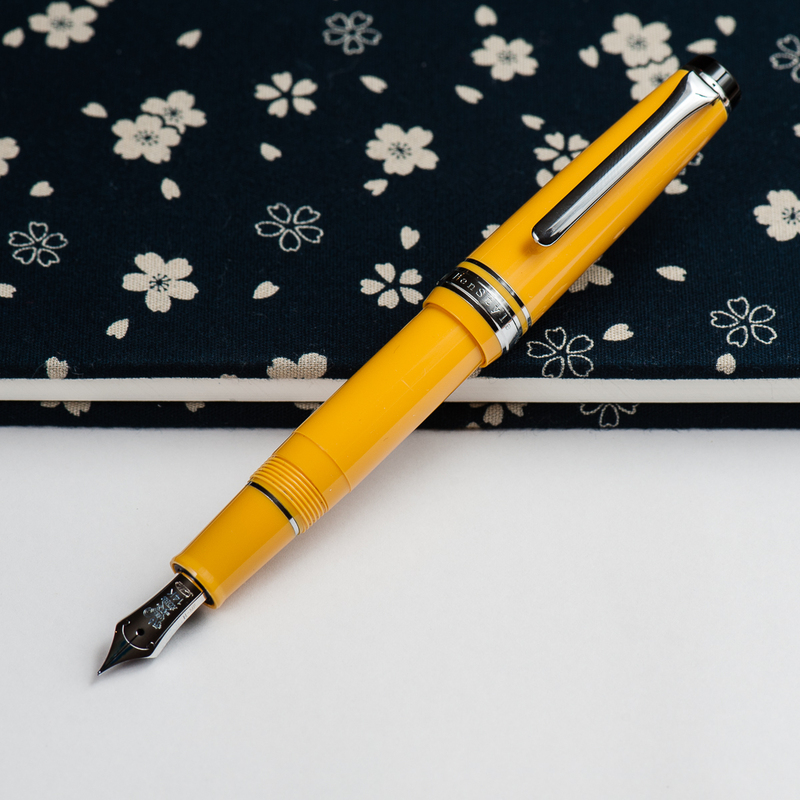 It is springier than a Classic or Slim size Pro Gear and provides flair to my writing that I appreciate very much. 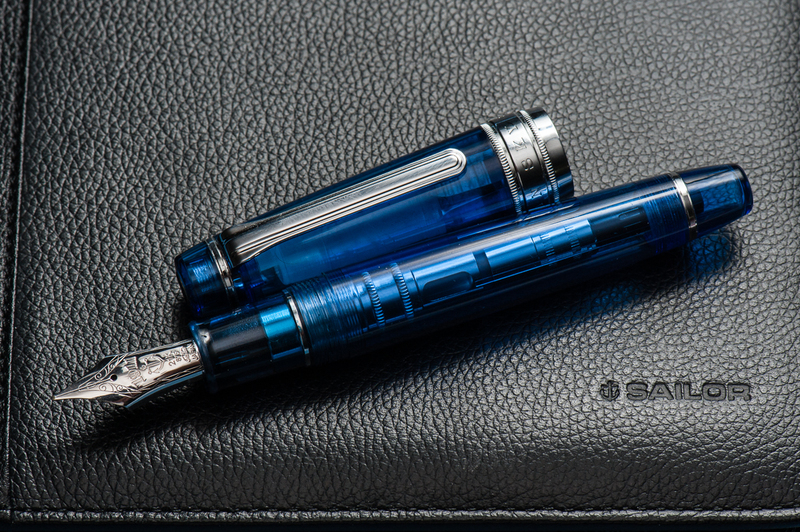 Because of the price point of the King of Pen, it does dig into your wallet a bit..er..a lot. But it’s all a question of value. I would like to repeat that I won this second hand pen via an auction for a great price and I’m very happy about it. Would I purchase a brand new KoP Sky if this one didn’t come along? **cough** I would **cough**. I’ve wanted one ever since I saw Pam’s Pro Gear Slim Sky. 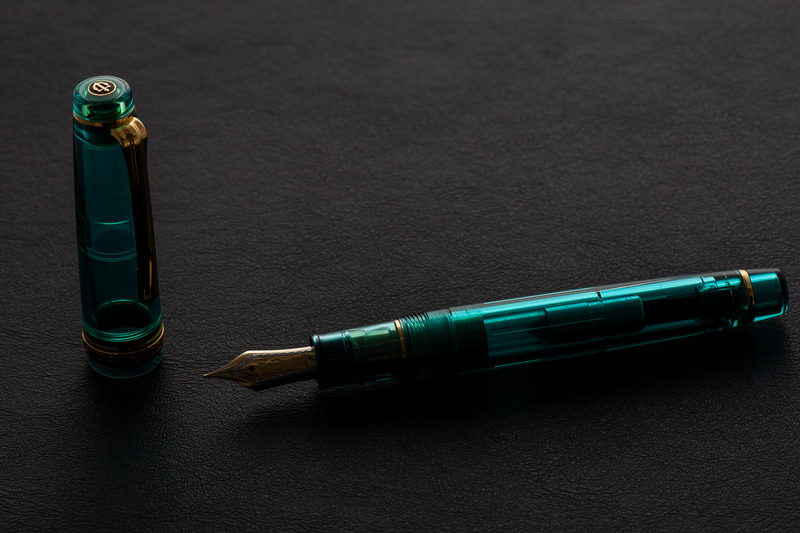 Update 05/15/2017 : We are adding the information that the Turquoise Sailor Pro Gear pictured above was a 2016 limited edition pen release via the Japanese shop, Wancher. Pam purchased this online via the global marketplace, Rakuten. 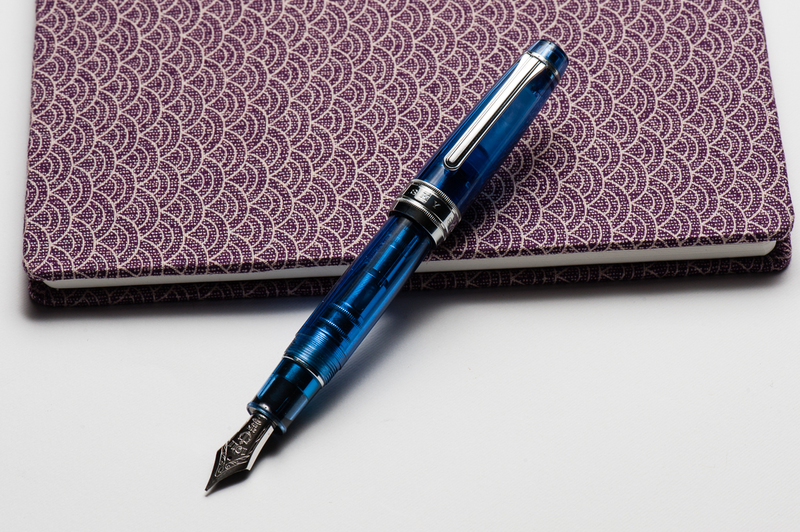 And the Kingfisher finish that Claire is holding below is another Japanese limited edition Sailor Pro Gear. These limited edition finishes are currently unavailable via US retailers. We apologize for not establishing this bit of information. Our main focus for our pen reviews is to show how different pen sizes feel on different hand sizes and we hope that we continue reflecting this point. 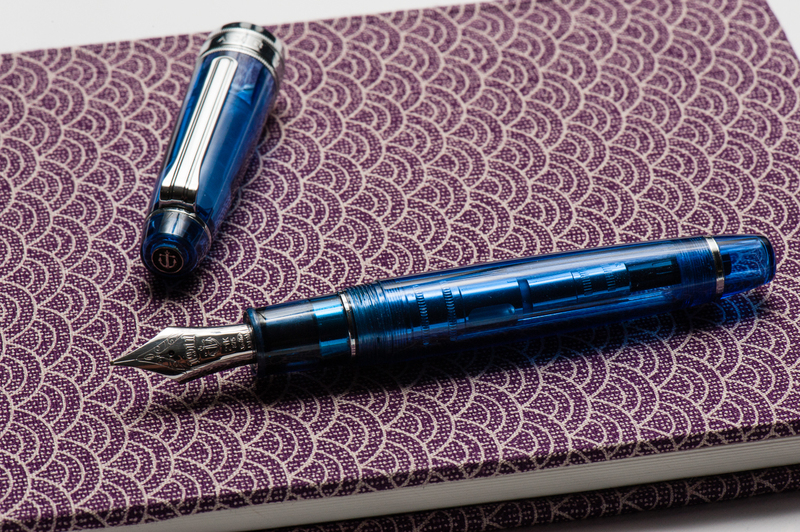 Claire: Hang with me here, I can wax poetic about the Sailor Pro Gear all day long. This is by far my favorite pen available on the market. I currently own three Pro Gears and one Realo. 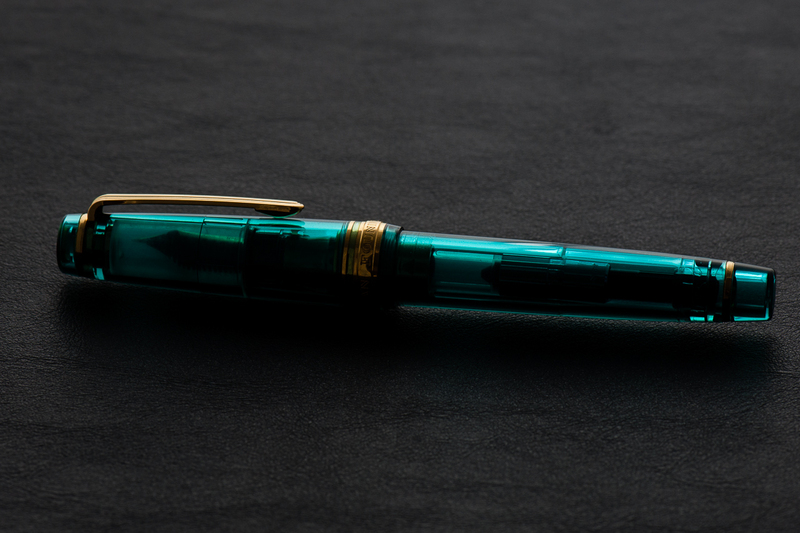 I love the way this pen looks, the flat finials pull the pen together in the best possible way. The size and weight is perfect for my hand. 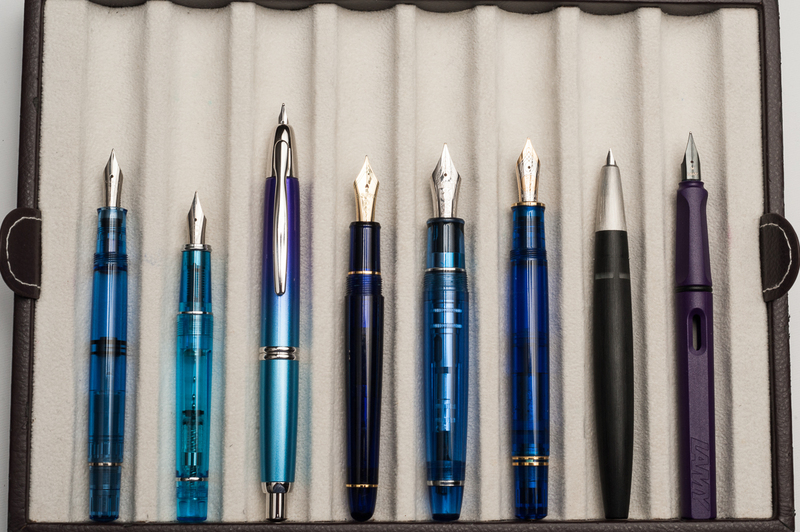 If I had to choose one pen to write with for the rest of my life, a Pro Gear would be that pen. I love how many colors are available, especially if you’re willing to do the leg work on Japanese exclusives. Franz: A turquoise-y disposition! (Yep… that will now be a term and a hashtag, thank you very much!) For the past six months I have come to appreciate Sailor pens more and that’s due to both Katherine and Pam. Largely, Pam is to blame though for she has set out to collect some special/limited edition Pro Gear Slim and Classic pens available. And what’s not to like? 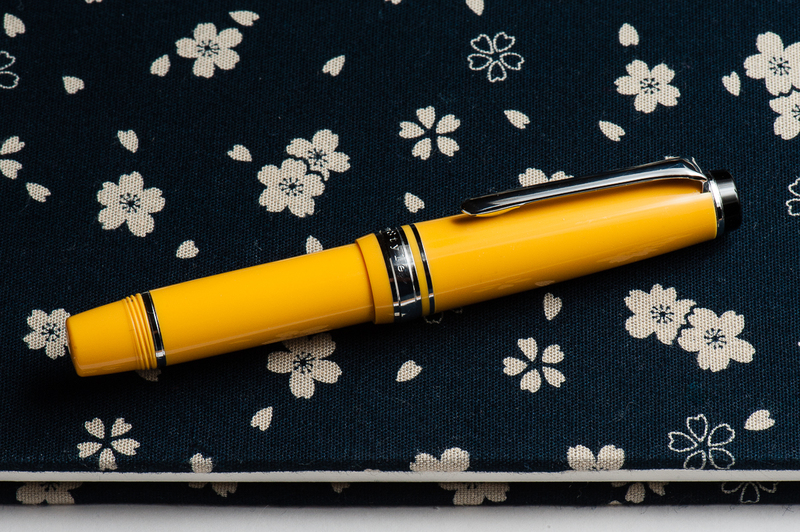 It’s a pen that Sailor designed almost 15 years ago so the aesthetic works. 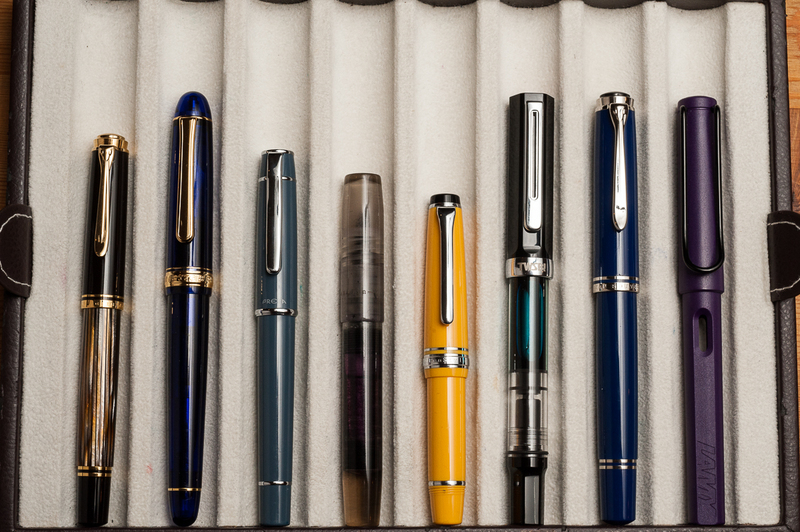 The Professional Gear has been on my “list” of pens to own for the longest time. Just like the three ladies above, the flat ends definitely appeal to my taste. 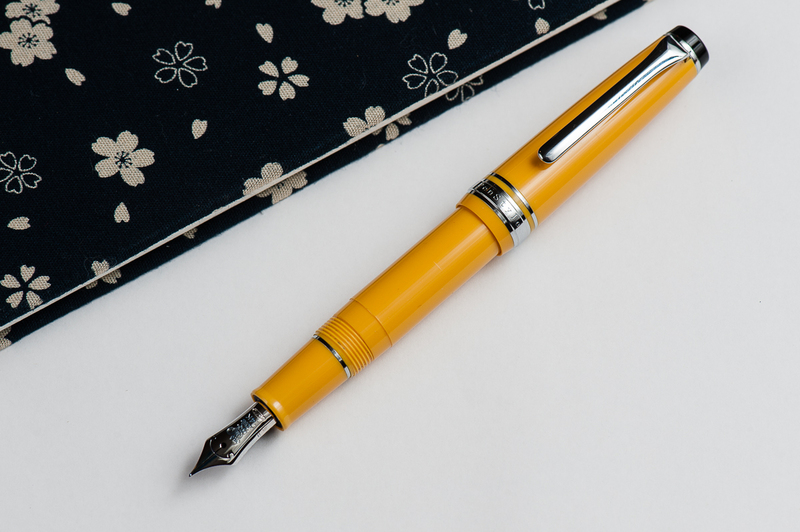 The gold trim blends well with the color of the pen and gives it a warm feel. Katherine: The MF is fun to write with — fine enough for daily use but just wide enough to see the character of one’s ink. My Pro Gear (which I’ve written with more) has a H-F nib, which is extremely fine, but also wet. It’s a magical combination of wet and fine, which leaves me with saturated but very fine lines. Additionally, despite being labeled a “hard” fine, it has some bounce to it. I wouldn’t recommend it, but I can get line variation out of mine. 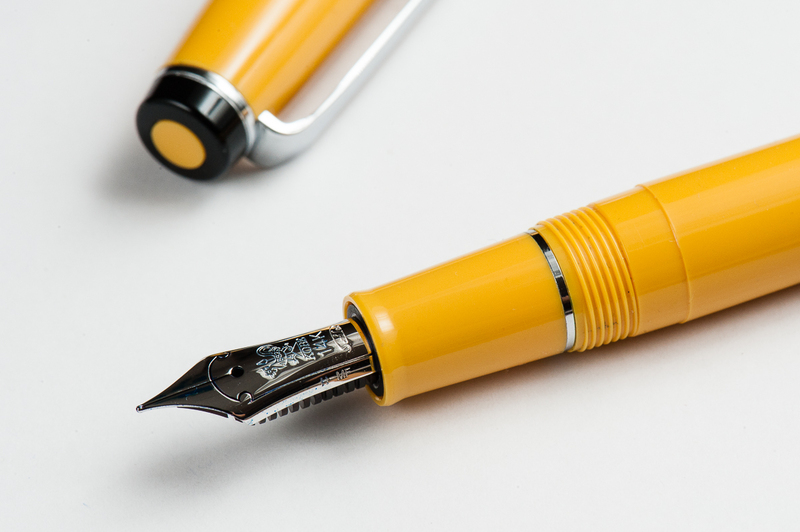 And, at the risk of sounding overly enthusiastic, I also love the feedback on this nib. It’s a nice pencil-y feeling that isn’t too smooth, it’s got character! 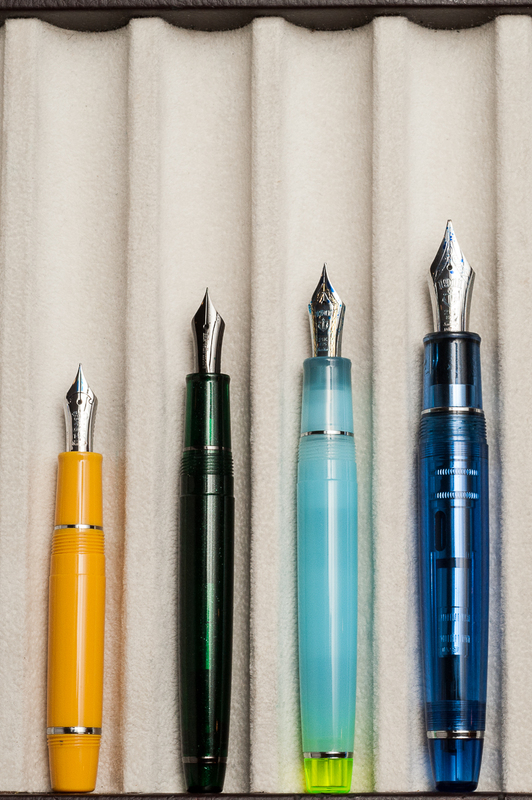 Pam: I have had some variability in my experience with the Sailor 21k MF nibs. I have seen some that are more on the fine and harder end of the spectrum while some are broader and slightly wetter. 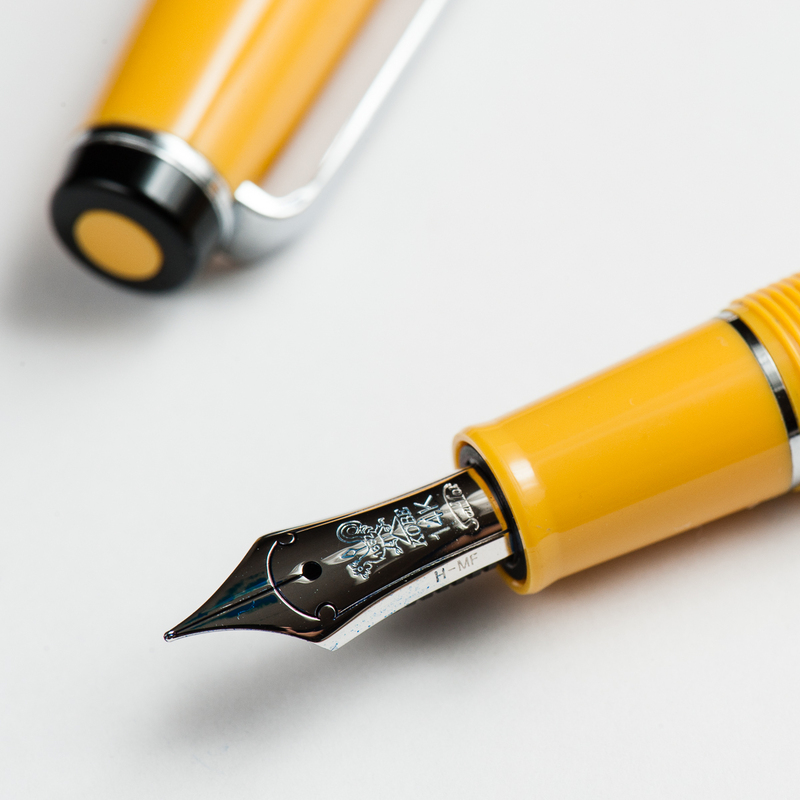 Given that the MF nib is broader than the F or EF, the nib is wonderfully smooth and really shows off the ink qualities like shading or sheen really well. 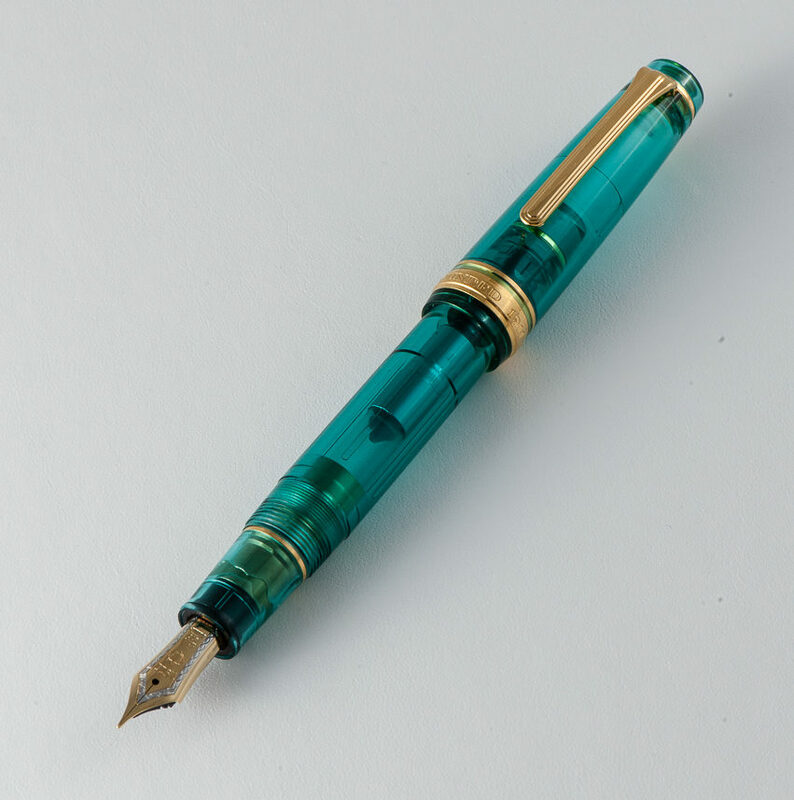 Surprisingly, I didn’t consider grinding the MF down, probably because I paired this turquoise demonstrator Progear with Robert Oster’s Fire and Ice; be still my heart, the sheen! Claire: The 21k hard fine Sailor nib is my favorite. I love how hard the nib is; though it isn’t too hard. 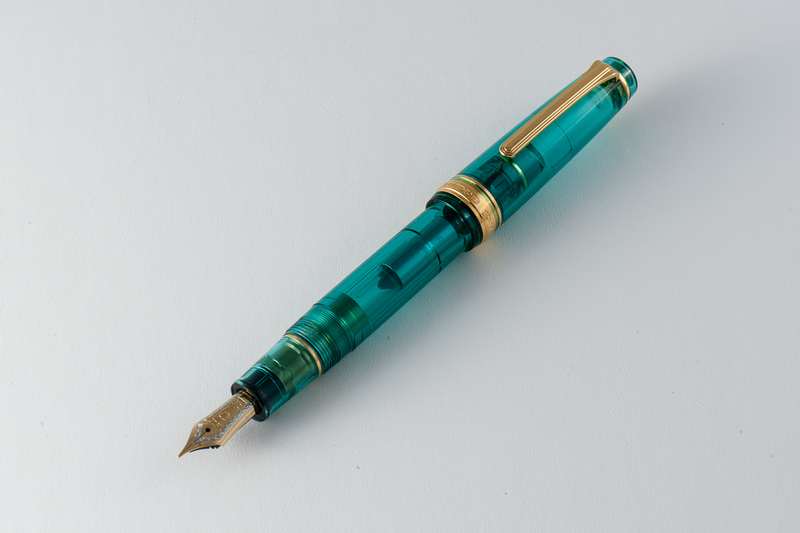 It’s hard to quantify what makes this a Goldilocks nib in my opinion. I love the pencil like feedback that these 21k nibs give so consistently. 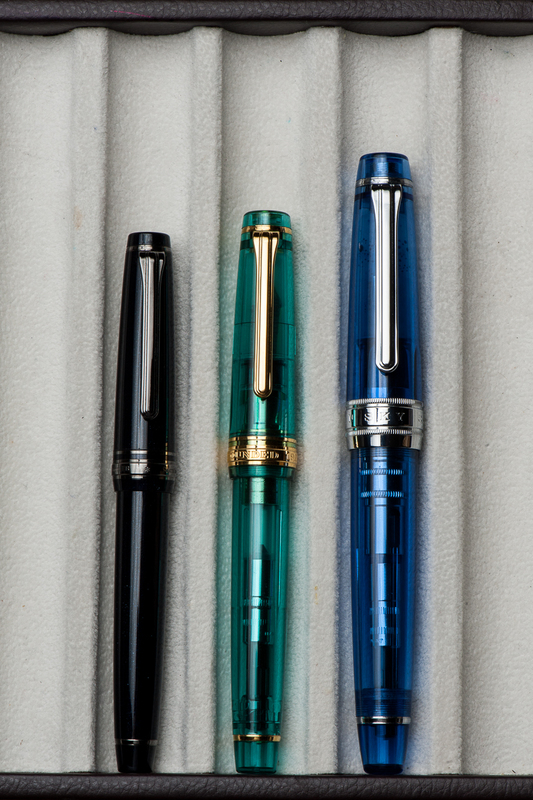 All three of my fine nibs have given me the same lovely out of the box performance. The only qualm I have with this pen is the converter isn’t the best. Sailor converters don’t hold very much ink and are notorious for having issues. Typically when I get a new Sailor converter I open it up and put silicone grease on the threads and piston. That so far has saved me from running into any of the issues I’ve heard others to have. 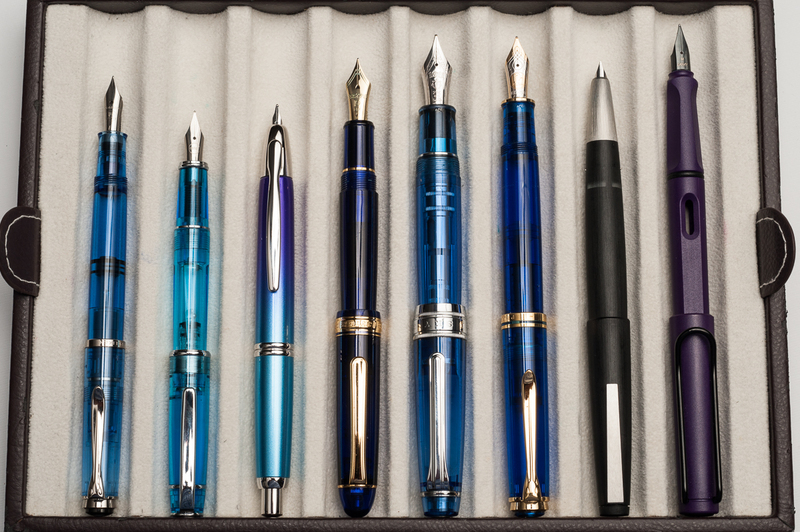 Franz: In my experience, Sailor nibs are well tuned out of the box. And this H-MF is no exception at all. 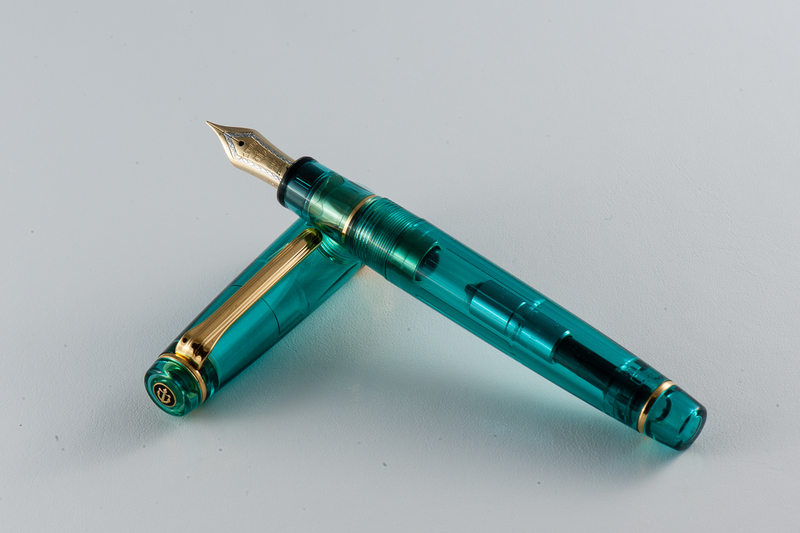 I enjoyed writing with this nib for hours. (I have held it hostage from Pam for a while now) And like Katherine, I found the feedback to be pleasant like writing with a pencil. Katherine: This pen surprised me with how small it is for the not “slim” version. And it’s a wonderful size for my small hands. Both this and the Pro Gear Slim are comfortable for me to use for extended periods of time, but I do prefer this to its smaller sibling (Which is unfortunate for my wallet. And there are slightly fewer limited/store editions available in the Pro Gear). This pen isn’t too narrow, it’s well balanced and the nibs are a delight to write with — I regularly toy with the idea of collecting on in each nib size, but haven’t quite convinced myself not to stick to my pen limit. 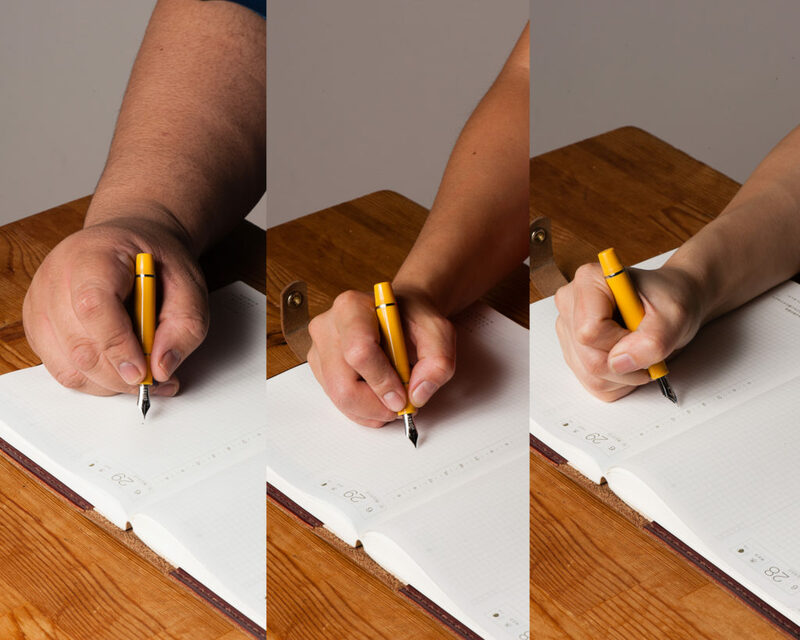 Pam: As all pen addicts know, the smallest differences can make all the differences turning a good pen to a great pen. Fortunately, going between the Progear Slim and the Progear isn’t such a large difference that it’s an issue. In my hand, the Progear is a bit longer, equally well balanced and slightly girthier than the Slim. The extra girth is great for longer writing sessions in my opinion. Even in more petite hands, the Progear is comfortable and well balanced, capped or uncapped. Honestly, if the Slim is comfortable for you, the Progear would be equally comfortable. If the Slim is slightly uncomfortable for you, the Progear will be just right. All I can say is, beware of picking up a Progear, you won’t want to put it down. 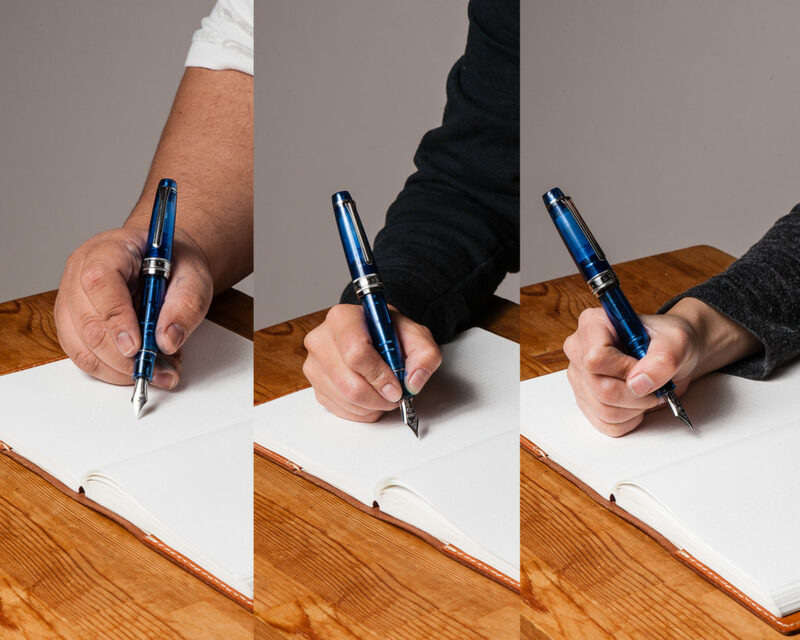 Claire: I can write with a Pro Gear all day long without running into any hand fatigue. 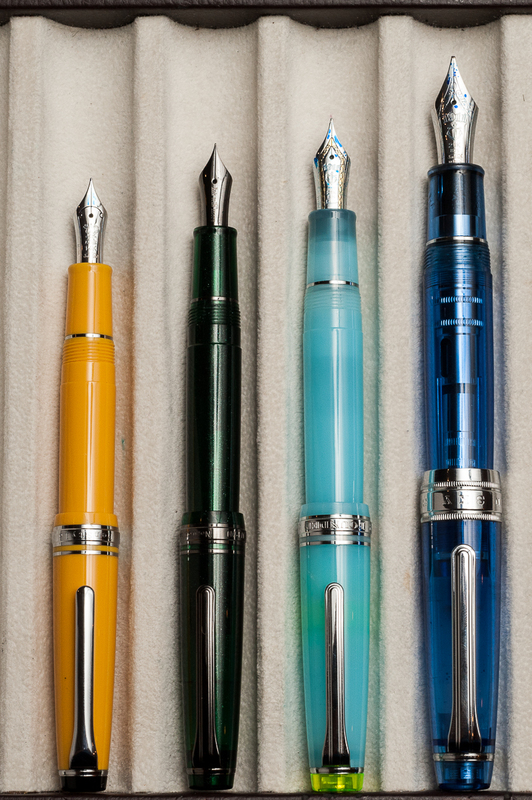 Many times when I’m taking notes for school I’m switching between Pro Gears so I can have a variation in ink color. The way the section tapers fits my hand perfectly. The section on the Pro Gear is really what makes the pen. The more I write, the more I want to find more to write. 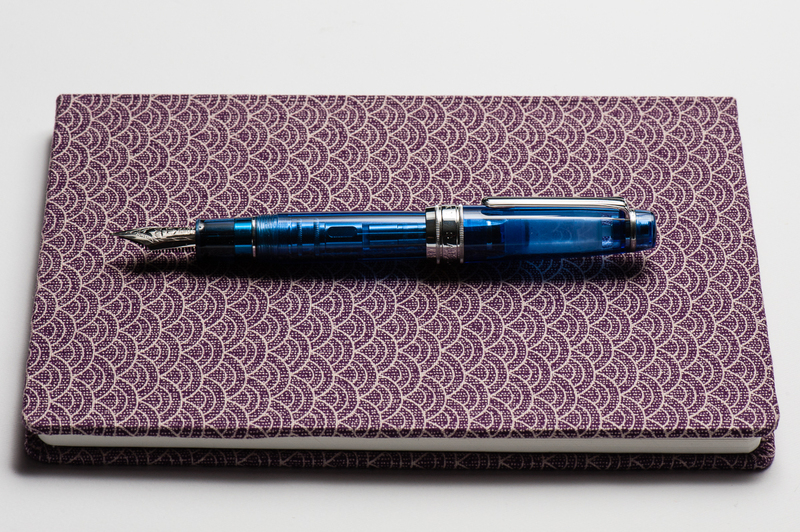 I really can’t write enough about how much I enjoy writing with this pen. Franz: The Pro Gear is slightly bigger in girth and length compared to the Pro Gear Slim. Because it is larger, it’s more comfortable to journal with. And I wrote blissfully for a good ten minutes. I even got to finish a letter for a friend with it. But once I unposted the cap, it became a bit tiresome even after only five minutes of writing. So definitely for my large paws, I gotta have it posted for longer writing sessions. Pam: I have at least one Progear or Progear Slim in my rotation at all times. The nibs can’t be beat and the finer nibs (EF in 14k or F in 21k) performs admirably on cheap office paper for work. The clips are secure without being overly tight and the pens do tolerate being in white coat pocket easily and well. 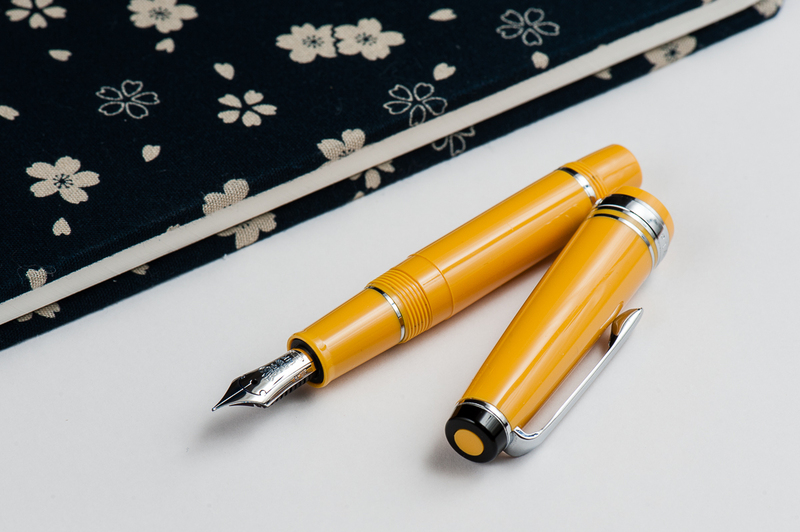 Additionally, depending on what colorway you choose, the pen can be subtle, professional and classic looking or bold, loud and modern. 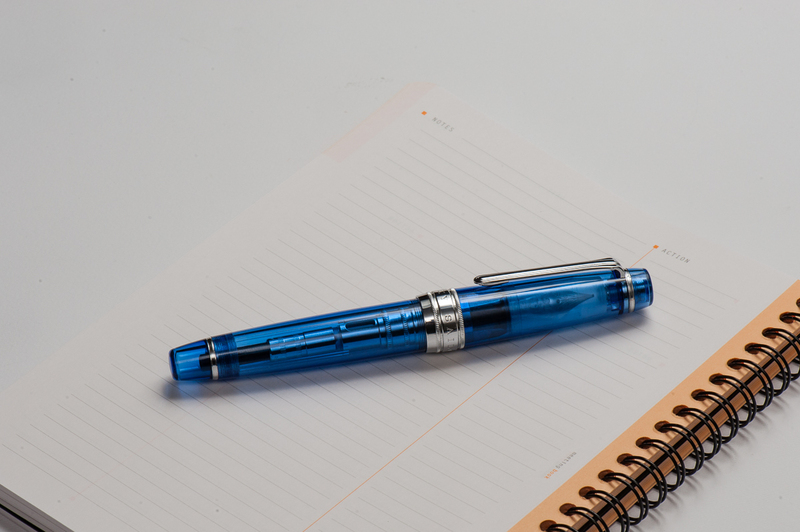 For those in the office setting, this pen can be like a tie, the pop of color or a small, subtle way to show off some personality. Claire: If I had a job where a fountain pen would be useful in day to day work, this would be the pen I would bring with me every single day. The Pro Gear is often the first pen I reach for when taking notes for class. When I graduate and move to a desk job, you can bet this will be one of the pens I carry with me on a day to day basis. At home, this is almost always the first and only pen I reach for for my evening journaling. Franz: I once again echo the three ladies above and agree that the Pro Gear is a nice pen to use on a daily basis for my workplace. The pen was clipped securely onto my dress shirt and was always ready to write. You do need to rotate the cap twice to deploy the pen but I just accepted this since it gives me happiness to use the pen. With signing my name multiple times at work, I didn’t feel the need to post the cap and the medium-fine nib was perfect for the copy paper used in the office. Katherine: I really like this pen. It comes in so many colors and I’ve been very tempted to collect quite a few. But, alas, my pen limit has prevented me from doing that and instead I only own one Pro Gear, but it’s a solid pen and I love writing with it. It’s a very comfortable pen and a very solid one. I would highly recommend it to anyone who’s thinking of purchasing — and it’s fun (and frustrating…) to hunt down crazy colors and limited editions to find the perfect one (or ten). Claire: The size of this pen is perfect, it’s just long enough to fit perfectly in my hand. The balance is exactly what I look for in a pen. 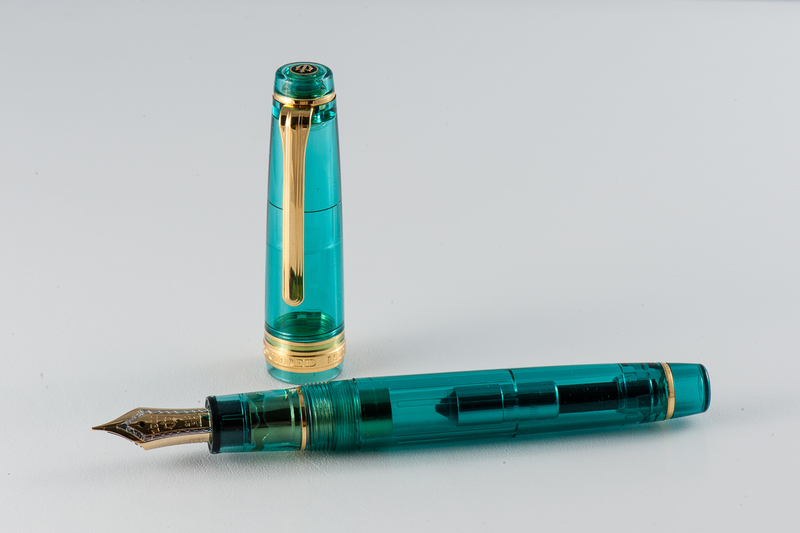 The tapered section allows the pen to be comfortable to write with without adding additional weight to the pen. I only have one gripe with this pen: the converter. While I haven’t run into any of the glaring issues I’ve heard of with this converter, I really wish it could hold more ink. Franz: Sailor has done right with the Professional Gear design. Proportions are great and the build quality is awesome. And just in case you still aren’t sure what my thoughts are, this pen is awesome. It is perfect for me posted, and “okay” unposted. I seem to have always hesitated to buy this pen due to its size in my hand. But after spending some time with Pam’s Pro Gear, I may just get one myself when I find a finish that attracts me. 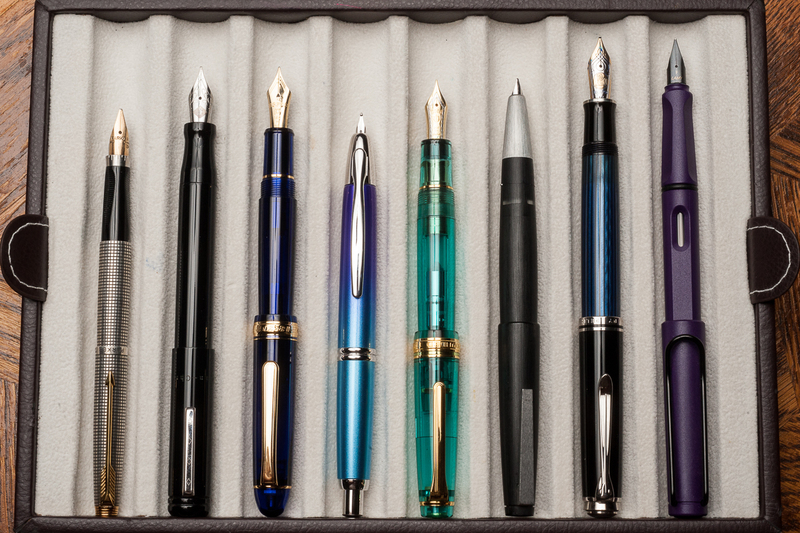 In closing, every serious pen user should pick up and write with a Sailor Professional Gear. You never know, this pen may just appeal to you and change your mind as it did mine.